Story Contracting recently completed works for Network Rail on-site at West Kilbride Station in North Ayrshire, Scotland. The station is managed by Abellio ScotRail and is on the Ayrshire Coast Line. The roof canopy is approximately 30m long and backed onto the station building which is no longer used as part of the station itself. 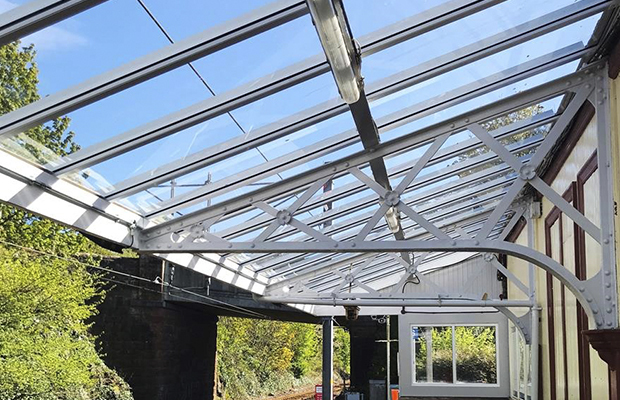 As part of the Network Rail – Year 3 Canopy Works Package, the West Kilbride Station remit included renewal of the existing glazing with new twinfix polycarbonate system, and general refurbishment of the steel work sections and timber facia/end screens. Temporary works include a cantilever scaffold platform for the full length of the canopy works, which includes edge protection to the perimeter of the roof. Deck protection and containment sheeting was also installed. The fully glazed canopy section was renewed with ‘Twinfix’ polycarbonate panelling. The existing canopy steelwork was prepped and M24 paint system applied. 30m of facia boards and 19m² of timberwork was installed and coated. 30m of heritage guttering was renewed with powder coated aluminium with a profile to match existing. 30m of leadwork was installed to the ridge of the canopy interfacing with the existing station building roof. All of these works were carried out using a combination of dayshift and nightshift working to allow the project to be completed in a tight time frame of 4 weeks and on budget.